Ship traffic through Canada’s Northwest Passage has more than doubled since 2004 and tripled since the 1980s, mostly thanks to much longer open-water seasons as the Arctic continues to warm. Today’s 300-350 voyages per year is expected to double again as both mining and tourism rise in the years ahead. In response, there are increasing calls to manage the increased ship traffic, both to improve safety and minimize environmental impacts. A new report from Pew Charitable Trusts draws on recent data, previous Canadian government reports, and First Nations concerns to make the case. “Corridors give people a roadmap to follow,” said Louie Porta, one of the report’s authors. 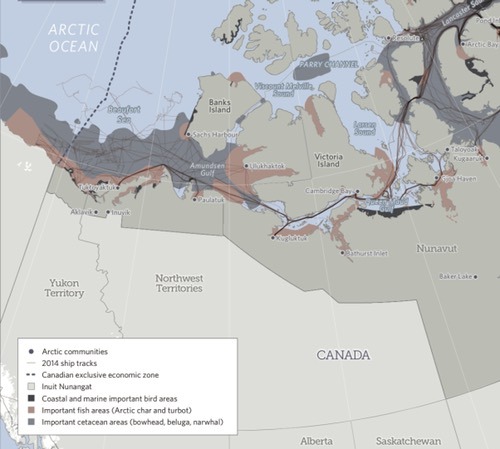 “A robust corridor system is a recommendation for vessels to stick to a very, very small portion of the Arctic waters as opposed to now, where there are no limits – vessels can basically go wherever they want.” The map below shows 2014 ship tracks criss-crossing key biologically important areas in the western part of the Northwest Passage; here’s a link to the full map. Government and Inuit groups have identified at least 38 areas of ecological and biological significance (EBSAs) occupying nearly 50 percent of Canadian Arctic waters. “There’s a high concurrence of vessel traffic patterns and areas of biological significance. We can’t say that ships can’t go where the environment is significant, but it’s possible to create a more flexible, dynamic policy that identifies what times of year ships can be in certain locations,” said Porta. . . . Under the proposed framework, shipping corridors would be identified by integrating human and vessel safety, environmental protection and Inuit rights. The Canadian Coastguard has been working on a similar plan to concentrate shipping traffic. 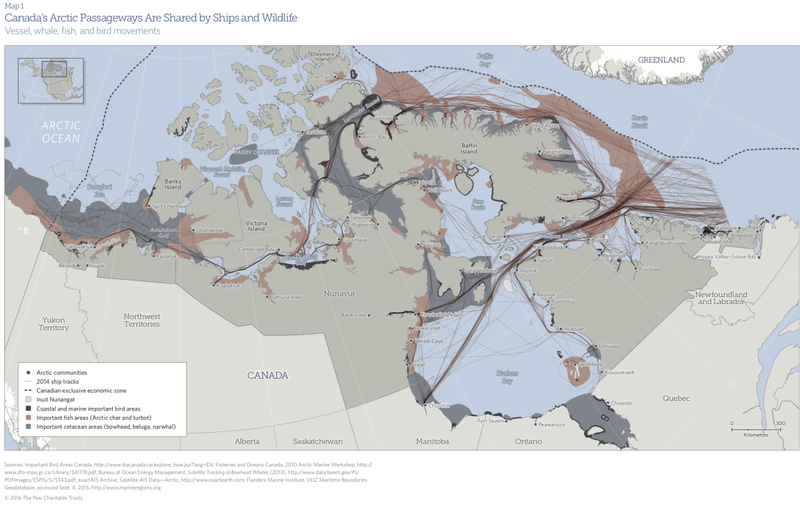 However, their current proposal for the Beaufort Sea allows shipping in 45% of regional ecological, biological and Inuit areas of significance, while the Pew report’s recommended lanes overlap just 25% of these key areas. Arctic shipping is a much bigger issue than just the Northwest Passage. Arctic Deeply has been quick to dive into this important topic, including a recent piece on the impact of Arctic shipping noise on whales, and a long Q&A with a geographer who focuses on climate change and the Arctic.